American physicist mission specialist astronaut 1984-1996. Status: Inactive; Active 1984-1996. Born: 1952-08-17. Spaceflights: 4 . Total time in space: 40.63 days. Birth Place: Montgomery, Alabama. PERSONAL DATA: Born in Faison, North Carolina, on April 14, 1929. Married to the former Elizabeth Jennifer Fowler of Hertfordshire, England. They have two sons. EDUCATION: Attended primary and secondary schools in Faison, North Carolina; received a bachelor of science degree in physics and a doctorate in medicine from the University of North Carolina in 1952 and 1963, respectively. SPECIAL HONORS: Recipient of the Air Force Legion of Merit (1956); the NASA Exceptional Service Medal (1972); the NASA Exceptional Scientific Achievement Medal (1974); the American Astronautical Societys Melbourne W. Boynton Award for 1975 (1977); two NASA Space Flight Medals (1983, 1985); the University of North Carolina Distinguished Alumni Award (1983); the Aerospace Medical Association Randy Lovelace Award (1984); the AIAA Jeffries Medical Research Award (1985); the Association of Military Surgeons of the United States Kern Award (1986); the NASA Exceptional Engineering Achievement Award (1988). EXPERIENCE: Following graduation from the University of North Carolina and having completed Air Force ROTC training, Thornton served as officer-in-charge of the Instrumentation Lab at the Flight Test Air Proving Ground. He later became a consultant to Air Proving Ground Command. As chief engineer of the electronics division of the Del Mar Engineering Labs at Los Angeles from 1956 to 1959, he also organized and directed its Avionics Division. He returned to the University of North Carolina Medical School in 1959, graduated in 1963, and completed internship training in 1964 at the Wilford Hall USAF Hospital at Lackland Air Force Base, San Antonio, Texas. Dr. Thornton returned to active duty with the United States Air Force and was then assigned to the USAF Aerospace Medical Division, Brooks Air Force Base, San Antonio, where he completed the Primary Flight Surgeons training in 1964. It was during his two-year tour of duty there that he became involved in space medicine research and subsequently applied and was selected for astronaut training. Dr. Thornton developed and designed the first mass measuring devices for space, which remain in use today. Dr. Thornton has logged over 2,500 hours pilot flying time in jet aircraft, is currently a Clinical Assistant Professor in the Department of Medicine, University of Texas Medical Branch, Galveston, Texas, and is an adjunct Professor at University of Houston, Clear Lake. NASA EXPERIENCE: Dr. Thornton was selected as a scientist-astronaut by NASA in August 1967. He completed the required flight training at Reese Air Force Base, Texas. Dr. Thornton was physician crew member on the highly successful Skylab Medical Experiments Altitude Test (SMEAT) -- a 56-day simulation of a Skylab mission enabling crewmen to collect medical experiments baseline data and evaluate equipment, operations, and procedures. Dr. Thornton was also the mission specialist on SMD III, a simulation of a Spacelab life sciences mission. Dr. Thornton was a member of the astronaut support crew for the Skylab 2, 3, and 4 missions, and principal investigator for Skylab experiments on mass measurement, anthropometric measurements, hemodynamics, and human fluid shifts and physical conditioning. He first documented the shift and loss of fluid changes in body posture size and shape, including increase in height and the rapid loss of muscle strength and mass in space flight. 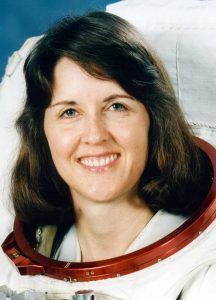 As a member of the Astronaut Office Operations Missions Development group, Dr. Thornton was responsible for developing crew procedures and techniques for deployable payloads, and for maintenance of crew conditions in flight. He developed advanced techniques for, and made studies in, kinesiology and kinesimetry related to space operations. During Space Shuttle operations he continued physiological investigations in the cardiovascular and musculoskeletal and neurological areas. He developed the Shuttle treadmill for in-flight exercise and several other on-board devices. His work concentrated on the space adaptation syndrome, with relevant investigations on STS-4, STS-5, STS-6, STS-7, and STS-8. Dr. Thornton holds more than 35 issued patents that range from military weapons systems through the first real-time EKG computer analysis. Space-related items include the first in-flight mass measurement devices, shock and vibration isolation systems, an improved waste collection system, an improved lower body negative pressure (LBNP) apparatus, and others. A veteran of two space flights, Dr. Thornton has logged over 313 hours in space. He served as a mission specialist on STS-8 in 1983, and STS-51B in 1985. Dr. Thornton continued his work in space medicine while awaiting his next flight opportunity. He worked on problems relative to extending mission durations in the Space Shuttle, in Space Station, and in space exploration, and has designed the necessary exercise and other hardware to support such missions. He continued analysis and publication of results from studies of neurological adaptation, and the study of neuromuscular inhibition following flight, osteoporosis in space and on Earth, and postflight orthostasis. He has completed designs for exercise and other countermeasure equipment for the Extended Duration Orbiter (EDO), and for Space Station Freedom, including improved treadmills, rowing machines, isotonic exercise devices, and a bicycle. Much of this is currently scheduled for flight. Dr. Thornton retired from NASA effective May 31, 1994. SPACE FLIGHT EXPERIENCE: STS-8 Challenger (August 30 to September 5, 1983). This was the third flight for the Orbiter Challenger and the first mission with a night launch from Kennedy Space Center, Florida, and a night landing at Edwards Air Force Base, California. During the flight Dr. Thornton made almost continuous measurements and investigations of adaptation of the human body to weightlessness, especially of the nervous system and of the space adaptation syndrome. This was a continuation of his previous work in these areas. Much of the equipment used was designed and developed by Dr. Thornton. The mission was accomplished in 98 orbits of the Earth, traveling 2.2 million miles in 145 hours, 8 minutes, 4 seconds. STS-51B/Spacelab-3 Challenger (April 29 to May 6, 1985). The Spacelab-3 science mission was launched from Kennedy Space Center, Florida, and returned to land at Edwards Air Force Base, California. During the 7-day flight, Dr. Thornton was responsible for the first animal payload in manned flight and other medical investigations. The mission was accomplished in 110 orbits of the Earth,traveling 2.9 million miles in 169 hours and 39 minutes. Born August 17, 1952, in Montgomery, Alabama. Married to Stephen T. Thornton, Ph.D., of Oak Ridge, Tennessee. She has two stepsons and three daughters. She enjoys scuba diving and skiing. Her parents, Mr. William C. Cordell and Mrs. Elsie Cordell, are deceased. His mother, Mrs. Helen Lee Gardner, and his father, Mr. Barton Brown Thornton, are deceased. Graduated from Sidney Lanier High School, Montgomery, Alabama, in 1970; received a bachelor of science degree in physics from Auburn University in 1974, a master of science degree in physics from the University of Virginia in 1977, and a doctorate of philosophy in physics from the University of Virginia in 1979. Member of the American Physical Society, American Association for the Advancement of Science, Sigma Xi, Phi Kappa Phi, and Sigma Pi Sigma. After Dr. Thornton earned her Ph.D. at the University of Virginia in 1979, she was awarded a NATO Postdoctoral Fellowship to continue her research at the Max Planck Institute for Nuclear Physics in Heidelberg, West Germany. In 1980, she returned to Charlottesville, Virginia, where she was employed as a physicist at the U.S. Army Foreign Science and Technology Center. Selected by NASA in May 1984, Dr. Thornton became an astronaut in July 1985. Her technical assignments have included flight software verification in the Shuttle Avionics Integration Laboratory (SAIL), serving as a team member of the Vehicle Integration Test Team (VITT) at KSC, and as a spacecraft communicator (CAPCOM). A veteran of three space flights, Dr. Thornton flew on STS-33 in 1989, STS-49 in 1992, and STS-61 in 1993. She has logged over 975 hours in space, including more than 21 hours of extravehicular activity (EVA). Dr. Thornton was a mission specialist on the crew of STS-33 which launched at night from Kennedy Space Center, Florida, on November 22, 1989, aboard the Space Shuttle Discovery. The mission carried Department of Defense payloads and other secondary payloads. After 79 orbits of the Earth, this five-day mission concluded on November 27, 1989, at Edwards Air Force Base, California. On her second flight, Dr. Thornton served on the crew of STS-49, May 7-16, 1992, on board the maiden flight of the new Space Shuttle Endeavour. During the mission the crew conducted the initial test flight of Endeavour, performed a record four EVA's (space walks) to retrieve, repair and deploy the International Telecommunications Satellite (INTELSAT), and to demonstrate and evaluate numerous EVA tasks to be used for the assembly of Space Station Freedom. Dr. Thornton was one of two EVA crew members who evaluated Space Station assembly techniques on the fourth EVA. STS-49 logged 213 hours in space and 141 Earth orbits prior to landing at Edwards Air Force Base, California. 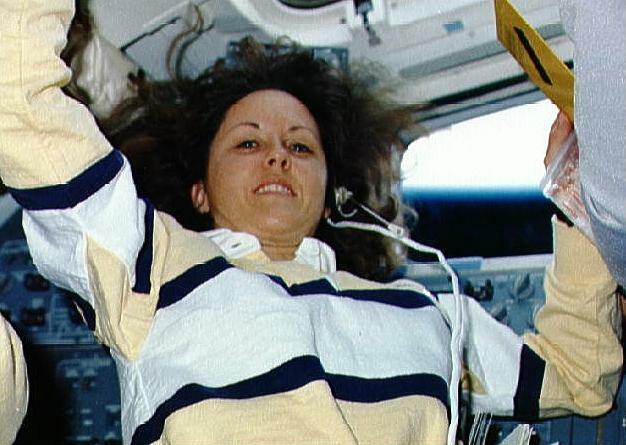 On her third flight, Dr. Thornton was a mission specialist EVA crew member aboard the Space Shuttle Endeavour on the STS-61 Hubble Space Telescope (HST) servicing and repair mission. STS-61 launched at night from the Kennedy Space Center, Florida, on December 2, 1993. During the 11-day flight, the HST was captured and restored to full capacity through a record five space walks by four astronauts. After having travelled 4,433,772 miles in 163 orbits of the Earth, the crew of Endeavour returned to a night landing at the Kennedy Space Center on December 13, 1993. From October 20 to November 5, 1995, Dr. Thornton served aboard Space Shuttle Columbia on STS-73, as the payload commander of the second United States Microgravity Laboratory mission. The mission focused on materials science, biotechnology, combustion science, the physics of fluids, and numerous scientific experiments housed in the pressurized Spacelab module. In completing her fourth space flight, Dr. Thornton orbited the Earth 256 times, traveled over 6 million miles, and logged a total of 15 days, 21 hours, 52 minutes and 21 seconds in space. Dr. Thornton has announced she will leave NASA on August 1, 1996, to join the faculty of the University of Virginia. Family: Astronaut. Country: USA. Flights: STS-33, STS-49, STS-61, STS-73. Projects: STS. Bibliography: 12, 6106. 1952 August 17 - . Birth of Dr Kathryn Ryan Cordell 'Kathy' Thornton - . Nation: USA. Related Persons: Thornton. American physicist mission specialist astronaut 1984-1996. 4 spaceflights, 40.6 days in space. Flew to orbit on STS-33 (1989), STS-49, STS-61, STS-73..
1989 November 23 - . 00:23 GMT - . Launch Site: Cape Canaveral. Launch Complex: Cape Canaveral LC39B. Launch Platform: MLP2. LV Family: Shuttle. Launch Vehicle: Space Shuttle. STS-33 - . Call Sign: Discovery. Crew: Blaha, Carter, Gregory, Musgrave, Thornton. Payload: Discovery F09 / Magnum 2 [IUS]. Mass: 116,884 kg (257,685 lb). Nation: USA. Related Persons: Blaha, Carter, Gregory, Musgrave, Thornton. Agency: NASA Houston. Program: STS. Class: Manned. Type: Manned spaceplane. Flight: STS-33. Spacecraft Bus: Shuttle. Spacecraft: Discovery. Duration: 5.00 days. Decay Date: 1989-11-28 . USAF Sat Cat: 20329 . COSPAR: 1989-090A. Apogee: 214 km (132 mi). Perigee: 207 km (128 mi). Inclination: 28.50 deg. Period: 88.70 min. Manned five crew. Deployed a classified payload. Orbits of Earth: 78. Distance traveled: 3,218,687 km. Landed at: Concrete runway 04 at Edwards Air Force Base, Cali. Landing Speed: 368 kph. Touchdown miss distance: 570.00 m. Landing Rollout: 2,366.00 m. Payloads: DoD Mission - third space shuttle night launch. 1989 November 28 - . Landing of STS-33 - . Return Crew: Blaha, Carter, Gregory, Musgrave, Thornton. Nation: USA. Related Persons: Blaha, Carter, Gregory, Musgrave, Thornton. Program: STS. Flight: STS-33. STS-33 landed at 00:35 GMT. .
1992 May 15 - . EVA STS-49-4 - . Crew: Akers, Thornton. EVA Duration: 0.32 days. Nation: USA. Related Persons: Akers, Thornton. Program: STS. Class: Manned. Type: Manned spaceplane. Flight: STS-49. Spacecraft Bus: Shuttle. Spacecraft: Endeavour. Tested tools and techniques for assembly of the International Space Station..
1993 December 6 - . 03:29 GMT - . EVA STS-61-2 - . Crew: Akers, Thornton. EVA Duration: 0.28 days. Nation: USA. Related Persons: Akers, Thornton. Program: STS. Class: Manned. Type: Manned spaceplane. 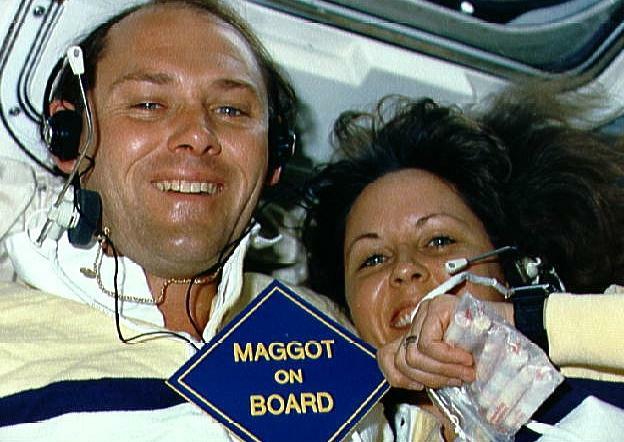 Flight: STS-61. Spacecraft: Endeavour, HST. Hubble Space Telescope Servicing Mission 1 - solar array replacement..
1993 December 8 - . 03:13 GMT - . EVA STS-61-4 - . Crew: Akers, Thornton. EVA Duration: 0.28 days. Nation: USA. Related Persons: Akers, Thornton. Program: STS. Class: Manned. Type: Manned spaceplane. Flight: STS-61. Spacecraft: Endeavour, HST. Hubble Space Telescope Servicing Mission 1 - COSTAR installation..
1995 October 20 - . 13:53 GMT - . Launch Site: Cape Canaveral. Launch Complex: Cape Canaveral LC39B. Launch Platform: MLP3. LV Family: Shuttle. Launch Vehicle: Space Shuttle. STS-73 - . Call Sign: Columbia. Crew: Bowersox, Coleman, Catherine, Leslie, Lopez-Alegria, Rominger, Sacco, Thornton. Payload: Columbia F18 / Spacelab LM / EDO. Mass: 15,250 kg (33,620 lb). Nation: USA. Related Persons: Bowersox, Coleman, Catherine, Leslie, Lopez-Alegria, Rominger, Sacco, Thornton. Agency: NASA Houston. Program: STS. Class: Manned. Type: Manned spaceplane. Flight: STS-73. Spacecraft Bus: Shuttle. Spacecraft: Columbia. Duration: 15.91 days. Decay Date: 1995-11-05 . USAF Sat Cat: 23688 . COSPAR: 1995-056A. Apogee: 241 km (149 mi). Perigee: 241 km (149 mi). Inclination: 39.00 deg. Period: 89.70 min. Carried USML-2 for microgravity experiments (attached to Columbia). Payloads: United States Microgravity Laboratory (USML) 2, Orbital Acceleration Research Experiment (OARE)..
1995 November 5 - . Landing of STS-73 - . Return Crew: Bowersox, Coleman, Catherine, Leslie, Lopez-Alegria, Rominger, Sacco, Thornton. Nation: USA. Related Persons: Bowersox, Coleman, Catherine, Leslie, Lopez-Alegria, Rominger, Sacco, Thornton. Program: Spacelab. Flight: STS-73. STS-73 landed at 11:46 GMT. .